During the First World War it is said that Herbert Kitchener, British Secretary of State for War, prompted the invention of a special graft for socks to prevent chafing. It came to be known as ‘the Kitchener Stitch’. This study day focuses on the relationship between knitting and wartime. 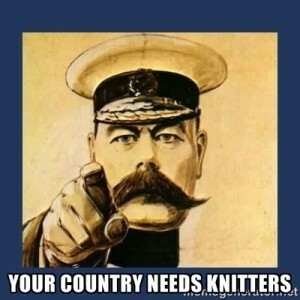 We are all familiar with the image of women on the home front knitting socks for the troops but knitting encompassed much more than this: Knitting was propaganda, knitting was fashion, knitting was therapy, knitting was a reminder of home and knitting was survival. Come and knit a balaclava or a sock for the troops; learn about knitted comforts; browse historic knitting patterns from Glasgow Women’s Library. The Full programme will be posted here closer to the event. Wonderful to find academic discussion of such an important activity. Thank you so much from Canada. I always wondered could it be him the graft was named after. Now I know.